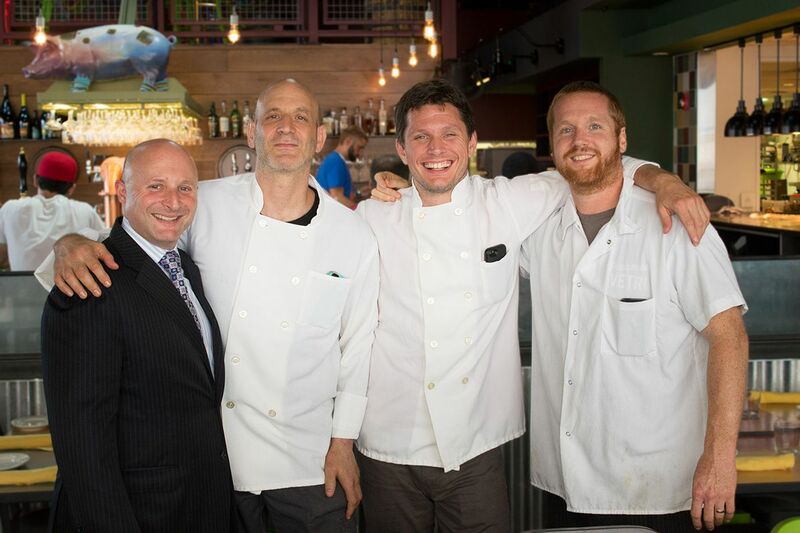 Vetri Family's top management is (from left) founders Jeff Benjamin and Marc Vetri, and chefs Jeff Michaud and Brad Spence. Creating an unprecedented intersection of food and retail, Marc Vetri and Jeff Benjamin have agreed to sell their restaurant group, the Vetri Family, to Urban Outfitters Inc., also based in Philadelphia. The deal, expected to be completed by the end of the year, includes Osteria, Amis, Alla Spina, Lo Spiedo, and Pizzeria Vetri. Vetri, the boutique Italian restaurant that was their first business when it opened on Spruce Street in 1998, will not be included in the sale. The business partners will also continue to run their Vetri Foundation for Children. Restaurant patrons will not notice a thing, Vetri said in an interview. "Nothing is changing. In meetings, everyone from Urban kept saying, 'It's more crucial than ever that you guys are at your restaurants.' " Terms were not immediately disclosed. No branding or logo modifications are planned, and no employee moves are expected. Benjamin, who has written a book on hospitality, said the restaurants' level of service would improve. "I've been the de facto back office for our company for years now," he said. "But after this, I'll be able to really concentrate on front-of-the-house operations and quality control." In addition to taking over such office duties as payroll and human resources, Urban Outfitters' infrastructure will provide the Vetri Family with ready access not only to growth capital, but also the professional services that are crucial to expansion, such as real estate specialists, architects, designers, and builders. URBN will get a jump on the food game, in return. Integrating restaurants next to its clothing stores in so-called lifestyle centers has been a key company initiative for several years. URBN chief development officer Dave Ziel said trends show that disposable income is increasingly shifting from retail and into food. Benjamin added: "Until they invent actual replicators like on Star Trek, e-commerce is not a threat to the restaurant business." There's also a philosophical component to the concept. "We think retailing needs to become more experiential," Ziel said. "I think there's a craving for real socialization beyond social media." To incubate that socialization (and, of course, to encourage potential shoppers to visit retail storefronts), URBN in 2013 began a program of developing centers and stores that contained both edible and tangible goods. Urban Outfitters Herald Square opened in June 2014 with a coffee and snack shop called UO Cafe. Urban Outfitters Space 24 Twenty is opening in Austin, Texas, with both a Pizzeria Vetri and Symon's Burger Joint by chef Michael Symon on the grounds. On the Main Line, the proposed Devon Yard lifestyle village includes a branch of Pizzeria Vetri, Amis, Anthropologie, and Terrain. URBN also operates cafes inside its two current Terrain stores, in Glen Mills and Westport, Conn., as well as Shop 543, the cafeteria at the company's Navy Yard headquarters that is home base for Vetri's annual Great Chefs Event fundraiser. All of URBN's current food and beverage brands will be folded into and managed by the Vetri Family. The restaurant veterans will also be tasked with helping Urban develop food and beverage concepts - a challenge both Vetri and Benjamin say they are very much looking forward to. "It's like after 17 years, Jeff and I are renewing our vows instead of getting a divorce," Vetri said, clearly energized by the whole deal. Ziel was equally enthusiastic. "I'm going to work with Marc and Jeff every day from here on out, and I think that's fantastic," he said. "I like them, so it feels good, but it also makes business sense. They're the food experts, and we're the growth experts." Somewhat paradoxically, the deal came about because Vetri and Benjamin were not actually looking for investors. After Pizzeria Vetri launched in September 2013, the restaurateurs said they were hit with a barrage of pitches, from friendly suggestions - "I could put together an investment group for you!" - to more calculated spiels: "You're the next Shake Shack. Let me invest!" But from the beginning, when Vetri took out a $100,000 SBA loan to open at 1312 Spruce St. and made Benjamin his partner, the pair has always been self-reliant. They were reluctant to give up creative control to outside investors, and so their subsequent expansion was also entirely self-funded. "You want to grow because you don't want to lose employees, so you take on more debt," Benjamin said. "But Marc and I are getting older [they're 48 and 46, respectively], and there comes a time when you say, 'Do I really want to put my house on the line again?' Plus, my daughter is going to college soon." URBN executives, including CEO Richard Hayne, who founded the company in West Philadelphia in 1970, have always been close with the Vetri team. The relationship was cemented when Urban offered to host the Great Chefs Event eight years ago, and solidified when the Vetri Family moved its headquarters to the Navy Yard. It was about a year or so ago that the two entities realized that a relationship could be mutually beneficial. "We were just tossing ideas around, and then all of a sudden we were like, 'Wow - this could be real!'" Vetri said. Benjamin said the companies click because neither believes in acting "corporate." "We don't make decisions based on making money," Benjamin said. "We make decisions based on making something awesome." He pointed to milestones such as offering health insurance in 2000 and starting profit-sharing in 2001, both virtually unheard of in the restaurant industry at the time. Then there was the risk they took by opening Osteria on a stretch of North Broad Street that was devoid of retail. "When the industry says, 'Go right,' " Vetri said, "I go left." Although Urban is now a relative giant, with more than 560 wholly owned retail outlets worldwide, it embraces an entrepreneurial philosophy. "We're the smallest-feeling big company I know," said Ziel, who has been chief development officer for more than 10 years. That said, growth is always in the picture, especially because URBN is publicly traded. Pizzeria Vetri - which has two locations in Philadelphia, one in Austin, and two planned for Washington, D.C. - is the brand with the most growth potential. Will the Vetri name be dotting cities around the globe? "We still have to work on the strategy," Ziel said. "I'll tell you more in six months."